Newly constructed Berlin Green Park Hotel is situated on a hill, at a quiet place in the park. 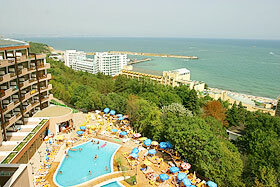 The hotel overlooks the Black Sea Coast and from the upper floors there is a wonderful panorama over the sea. 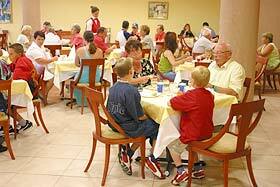 The hotel is ideally located, only a few minutes on foot away from the beach and the yacht port. Room facilities: Tastefully furnitured and full of features, the hotel rooms offer an atmosphere that makes you feel home. Conformable and spacious, the rooms are well equipped with modern amenities: air-condition, direct dial telephone, safe and mini bar /extra paid/, SAT-TV, hair drier, black-out curtains, shower and balcony. 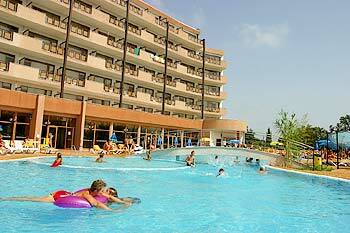 Guest may choose to book rooms with sea- or park view.